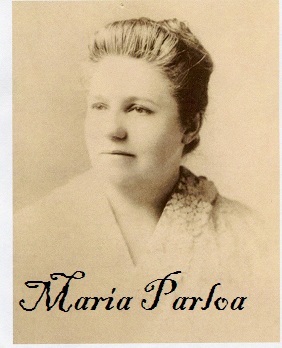 Maria Parloa gave her first public lecture on "Cooking and Digestion" in New London, Connecticut in the summer of 1876. Beginning in May (May 23, 1877), the following year she gave four introductory lectures in Tremont Temple in Boston, Massachusetts. These gave her the courage to open her first school in October 1877 at 174 Tremont Street. In 1878 Parloa gave lectures at Lasell Seminary, Auburndale and also at Miss Morgan's school in Portsmouth, New Hampshire. In the summer of that same year she visited schools in England and France and by 1879 she gave of course of lectures at the Assembly Lake Chautauqua, New York in connection with the Chautauqua literary and Scientific Circle and National Sunday School Assembly. Her school, Miss Parloa's School of Cookery, at 174 Tremont continued until 1882. She then went on to lecture in Chicago and other western cities. Later she would go on to establish a school in New York City. There is much confusion over whether or not Maria Parloa started the Boston Cooking School, and the truth is, she did not. Her school was a private effort, owned and managed by her. The Woman's Educational Association (not the Women's Educational and Industrial Union) in 1879 gave $100 for the establishment of the Boston Cooking School (BCS). It opened it's doors up the street from Parloa's school at 158 1/2 Tremont Street. Miss Joanna Sweeney was the formal teacher, however Maria gave demonstration on alternate Saturdays at BCS. Miss Parloa gives an account of the beginning. "The beginning of my work was accidental and did not have the commercial side in view. I was teaching in a little country school in Florida, and interested in all the people there. There seemed to be need of bringing all the people, children and parents, together at least once a week, and we tried to do it in the Sunday school in the sparsely settled part of the town. We felt the need of some sort of a musical instrument, and I tired to raise the money by asking various friends and acquaintances for it, and got quite a little that way; finally I gave a talk on cookery, prepared a paper carefully describing the processes of digestion, etc., and then with a little gas stove illustrated some things. "The talk was given in the vestry of a church, and with what I had already collected and the money received from this lecture I had nearly enough money to buy a small cabinet organ. Two of my friends gave the amount lacking, which was $10, and we bought the organ for the little Sunday School. After this lecture, so many of my friends urged me to do this thing that I thought seriously of it, and the next spring, at the end of the school year, when all teachers were asked to make their application for the next year, I asked the school board to hold the school for me a few months until I was sure as to whether I would return; they kindly did it. Then, to test whether there was interest in the work and if I had the proper qualifications for it, I arranged for a series of lectures in Boston in one of the lecture rooms in Tremont Temple. "The interest seemed to warrant my undertaking the work, and I decided to open a school in the fall, 1877, which I did on Tremont Street. The interest was very great, and all the time I had my school in Boston I had more than I possibly could do; but naturally the expenses were great, and the first year, although I worked so very hard, my expenses were $500 over my income from my work. Afterwards my expenses were not so great and the income was more than the outgo. Personally I do not think that the commercial side appealed to me very greatly, but naturally if I spend money for my work I must earn enough to pay my debts. The work to me has been, and still is, most interesting; and I feel that it is one of the largest and boradest works a woman can do, and if I had the time, strength, and means I would devote myself to it still. I feel that while a great deal has been done along these lines that it is only th ebeginning. It is a magnificent work for any young woman to take up." What is the exact source of your quotation from Maria Parloa, 1906, in which she talks about raising money to buy a "cabinet organ"?